About the artist: Esther Goh is a Singapore-based illustrator and art director whose work has been recognised and published internationally. Since beginning her career in illustration, she has collaborated with renowned brands such as Adobe, Facebook, Volkswagen, Shell, Esquire and Chanel. 1) About the Project: I collaborated with EYEYAH! magazine to create an illustration on the theme of “Internet” for their first issue. 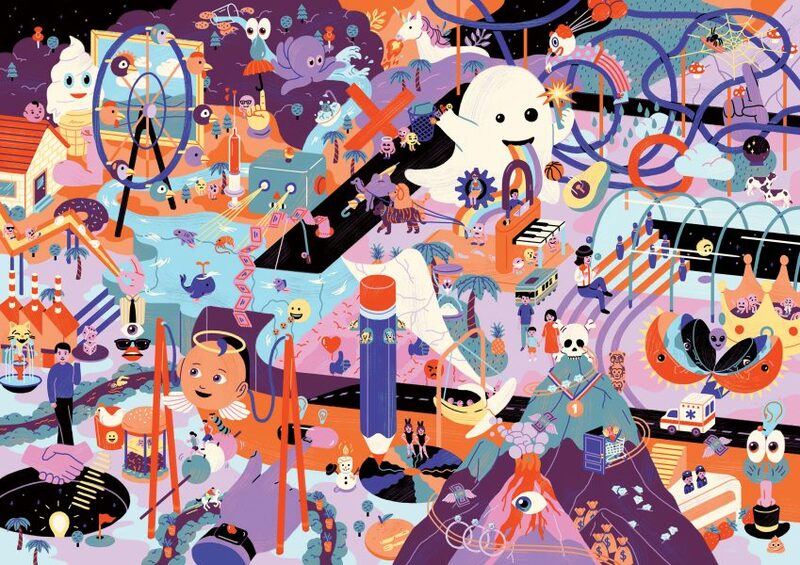 The piece references a bunch of Emojis from Apple that come together to form a crazy looking theme park. EYEYAH! 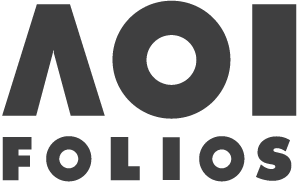 is an ongoing platform that aims to inspire creativity and improve observational and thinking skills in kids. 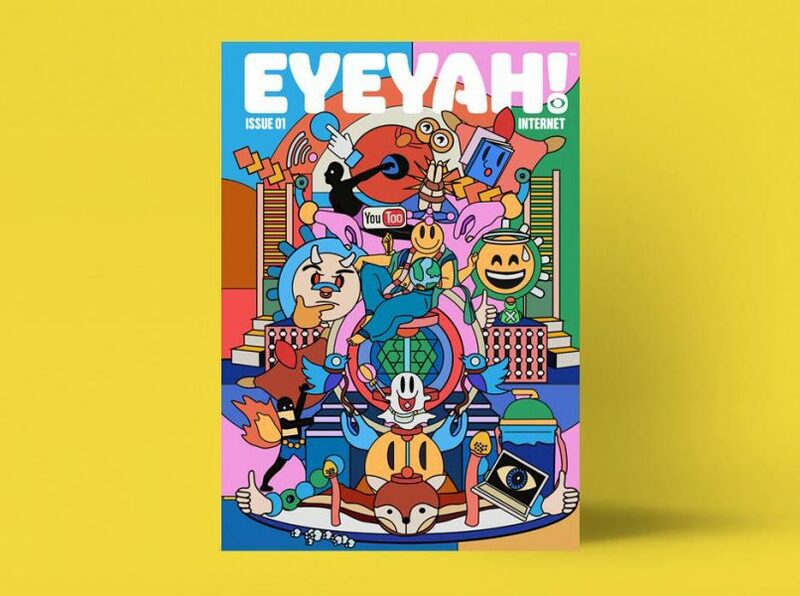 2) Brief: Steve Lawler, co-founder and creative director of EYEYAH!, had suggested several topics like famous memes, internet bashing, fun facts and Emoji, that I could possibly explore for my piece. At the same time, the main objective was to get kids to spend more time looking at and interacting with the artwork by keeping them interested, so we had to think of ways to make it engaging. 3) Research: We decided to focus on Emojis. A single Emoji conveys a word or emotion, but if we string them together they can form a story. Going beyond that thought, I imagined it would be challenging to try and fit as many Emojis as possible into an artwork that can still make sense perfectly. The final concept was a theme park, since it’s a place that most kids associate with play and fun. I looked at pictures of theme parks and play equipment for inspiration, as well as kids’ activity books. 4) Materials: The illustration was drawn and coloured entirely on Photoshop with a Wacom bamboo tablet, while the line art for colouring was done afterwards on the Adobe Sketch mobile app on the iPad Pro. 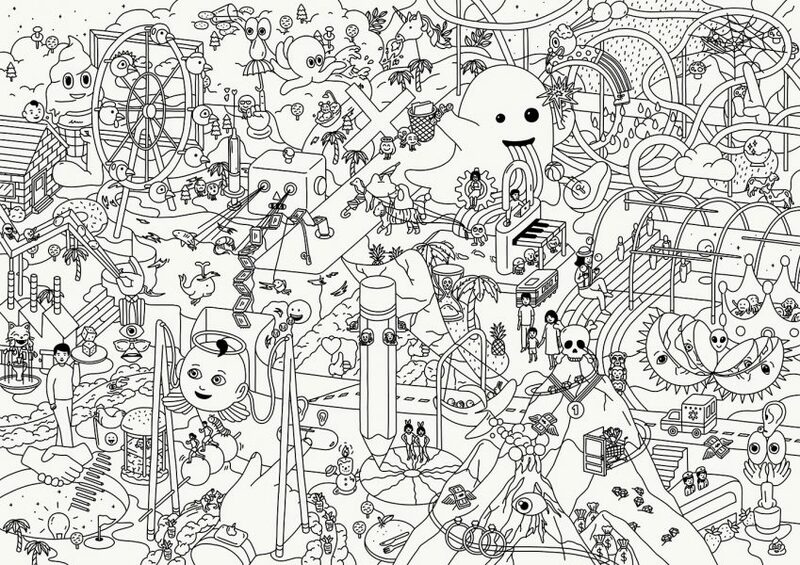 5) Process: I began with a rough sketch of the general layout and Emojis I wanted to feature prominently, before going into detail about the many rides and playful scenarios so that there will be something to be discovered in every corner of the theme park. Once I’m happy I started colouring the elements and continued tweaking from there. To add depth to the otherwise flat shapes, I drew over them lightly with textured brushes. 6) Obstacles: Nope, I thoroughly enjoyed working on this piece because I was given a lot of creative freedom. 7) Insights: I found so many Emojis that I never knew existed! 8) Distractions: This was mid 2017; I was juggling several heavy projects and towards the end as I was travelling in New York, I would spend a few hours every night in my hotel colouring this. Altogether it took me over a month on and off to complete it. 9) Numbers: for example, how many days, how many pages, use your imagination. 10) Reflection: I’m really happy to have contributed to their first issue – the EYEYAH! team even took it step further to have it animated (by Acid House) and displayed in VR format at the Singapore ArtScience Museum. It was also exhibited, along with other contributing artists’ works, at House of EYEYAH! during Singapore Design Week this year. 11) Advice: Work hard on your ideas and craft. Be unique and try to approach the same subject from new perspectives, don’t just draw what everyone else is drawing. I’m definitely still working on the latter. See her winning entry on her winners page. This image is fully animated. You can watch it here on her personal website.